Parishioners are terrified after protesters have disturbed mass at several Catholic churches across the Las Vegas area. The group, Koosha Las Vegas, includes members who clearly identify themselves as former Muslims turned Christians. They've been entering churches during services, shouting at Catholics that they need to repent now or else, and filming the acts and posting them on the Internet. The videos make clear the group has been active on the Las Vegas Strip and several other places around the valley. They're often seen with large signs and megaphones. The difference now is that they're going into houses of worship and causing disturbances. Some parishioners told KTNV in Las Vegas the actions have made them fear for their lives. In one video, a man behind the camera can be heard shouting: "Repent, and turn to Jesus Christ. Pope is a Satan! Pope is a Satan! Mary statue is a Satan!" The videos are taken by the very people passing out the pamphlets and shouting during mass in at least three incidents confirmed by police. The Catholic Diocese of Las Vegas confirmed to KTNV "multiple disturbances at several of their properties." "Stop worshipping to the idols! Idols not going to save you! You need Jesus Christ! You need the father, the son, and the holy spirit," a man shouts to a group of worshippers during Mass at Our Lady of Las Vegas Catholic Church on Dec. 5. 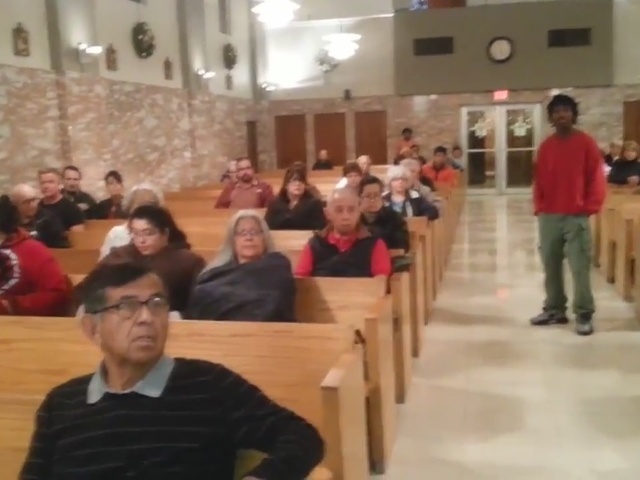 Parishioners KTNV spoke to said they were initially scared because of the recent climate of terrorism, and the group makes clear many members are Muslims turned Christian. Although they're preaching the word of Christ to other Christians, to be told "your religion is not going to save you", clearly audible on video, they said was unsettling. It's not just happening at church. The same group posted a protest outside Bishop Gorman Catholic School on Dec. 2. In that video, a man can be seen telling students, "If you look at the catechism of the Catholic church and you look at scripture, you know why god hates this religious system." The scene was so unsettling to some parents that many tried to dismantle it, honking their horns in the video. The man behind the camera can be heard saying "The demons are angry guys. The demons are angry." Las Vegas police told KTNV they did take a close look at the incidents and they do not appear to be related to any terrorist threat. They also said no arrests were made because technically no crime was committed. The Catholic Diocese of Las Vegas says they are working with police to educate clergy across the valley about what has recently happened. KTNV Crime & Safety Expert Randy Sutton weighed in on the incidents to say how fearful the community should be after an act like this. Sutton said, first of all, he disagrees with Las Vegas Metropolitan Police Department saying there was no crime committed. He said the men violated a Nevada statute, "disturbing a religious meeting." Sutton said they should absolutely be charged with a crime. "It's a misdemeanor crime but it is a crime nonetheless, it's on the books for just types of situations like this. There are statues that could be utilized to end this type of behavior," said Sutton. Sutton also said if the men were asked to leave and they refused, they could be charged with trespassing, too. The expert said this situation should be taken very seriously and it could have easily ended up violent. Sutton said, in light of recent terror attacks, every person in the church had a very good reason to be concerned. "This is really unusual behavior. This isn't something that happens all the time. So the fact that it even happened, would be enough to cause alarm and legitimately so," he said. 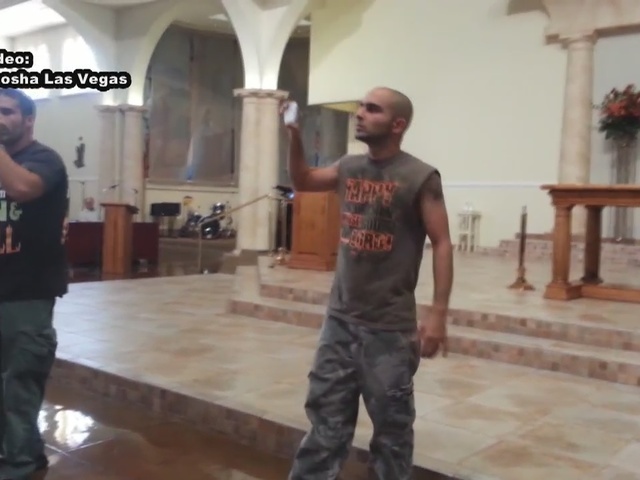 Catholic churches in Las Vegas are being stormed by an organized band of crazed evangelicals known as Koosha Las Vegas. They invade churches during Mass, shouting at parishioners to repent. "Pope is Satan!" "Mary is a Satan!" "Stop worshipping the idols!" "Idols are not going to save you!" "You need Jesus Christ!" Police have confirmed at least three incidents. Catholic school students are also being harassed. "If you look at the Catechism of the Catholic Church and you look at the Scriptures," the bigots scream, "you know why God hates this religious system." The cops have thus far not made any arrests, claiming no law has been broken. They are mistaken. The First Amendment to the U.S. Constitution guarantees religious liberty. If that means anything, it means that people of faith must be free to practice their faith. Moreover, these Nazi-like tactics are prohibited by the Nevada Constitution, the second ordinance of which reads as follows: "That perfect toleration of religious sentiment shall be secured, and no inhabitant of said state shall ever be molested, in person or property, on account of his or her mode of religious worship." There are also laws against trespassing, as well as hate crimes statutes. We are asking the Office of The Sheriff at the Las Vegas Metropolitan Police Department to arrest any person who storms a Catholic church, or any house of worship. They need to be prosecuted with the full force of the law.